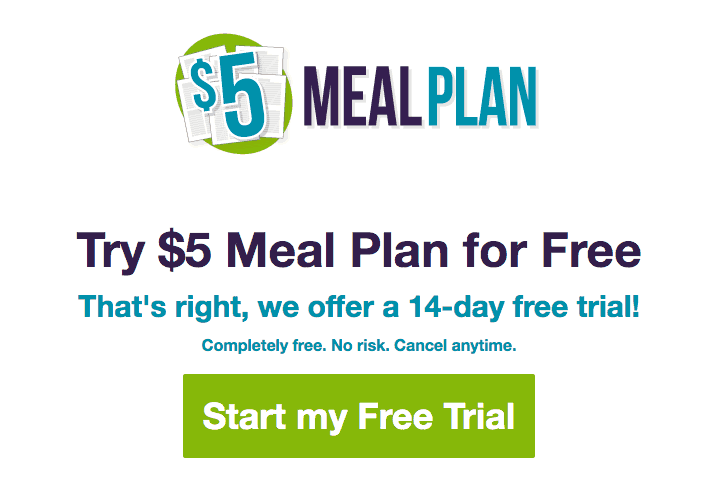 $5 Dollar Meal Plan Review | Can You Spend a Little to Save a Lot? 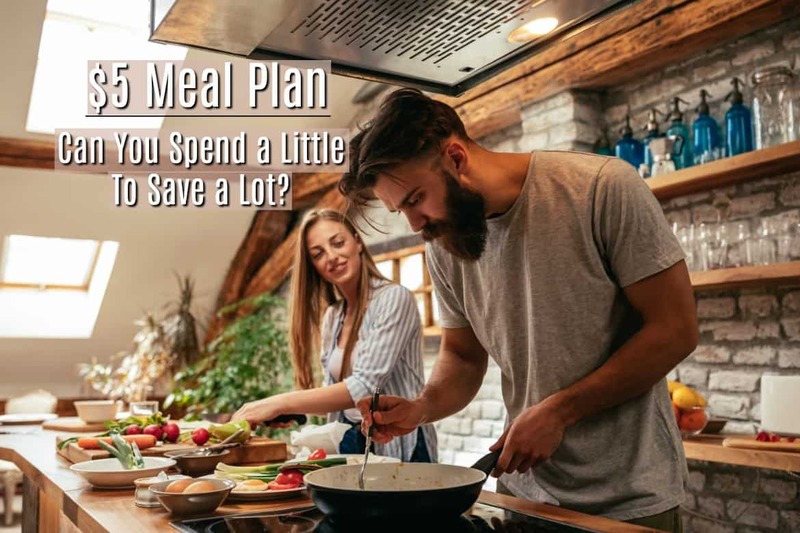 Home Saving Money $5 Meal Plan Review – Can You Spend a Little to Save a Lot? Why would you pay money for someone to tell you what to eat each week? Those were my thoughts for a long time, until I tried $5 Meal Plan. I was so surprised at the effect it had on my budget, that I had to do a $5 Dollar Meal Plan review. What I found, was that I was being penny wise and pound foolish. 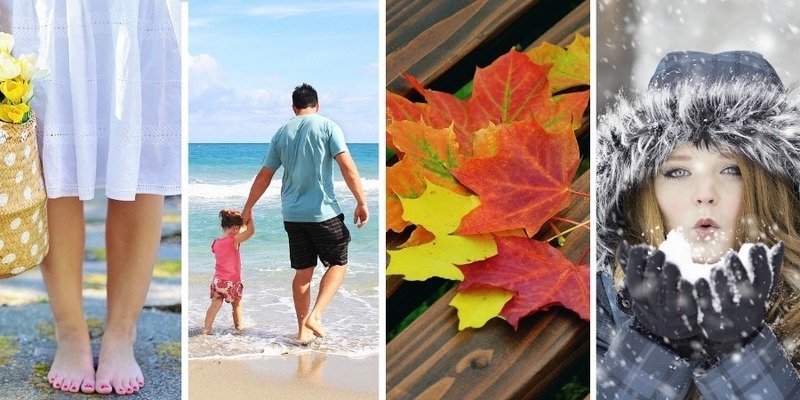 Sure, it’s easy to let a lot of money slip through our fingers each month – and I sure have. But sometimes spending a little can save you a lot. Food is one of the highest monthly expenses for most people, but planning your meals can save literally hundreds of dollars each month. But the fact is, not many people actually do plan their meals. Our free time is valuable, and to tell you the truth, I’m hesitant to pay someone for things I can do myself. But DIY’ing things isn’t always cheaper. In fact, $5 Meal Plan showed me that just winging our food buying was costing me a lot more each month. What Does the Plan Actually Look Like? How Healthy are the Recipes? What’s the Advantage of $5 Meal Plan Over Other Food Plans? 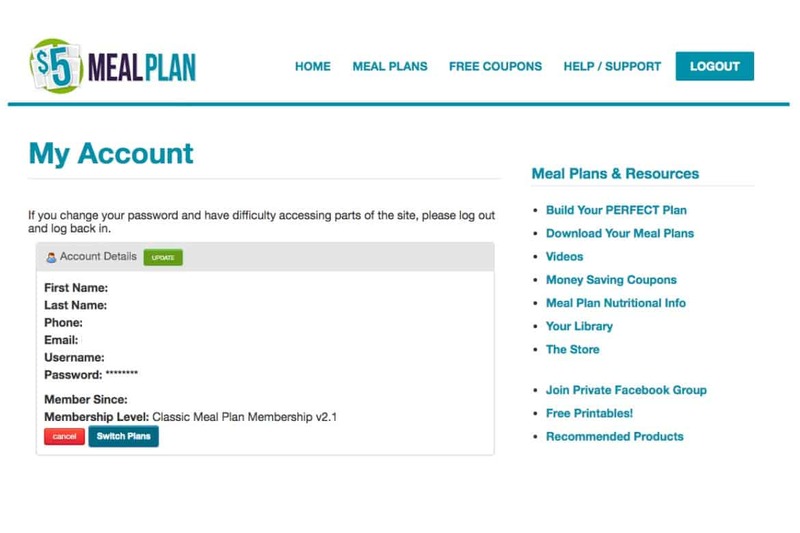 The aim of $5 Meal Plan is to cut costs by having a meal plan, but to make the planning as easy as checking your email. Once you join, you’ll have access to hundreds of full meals, where you can select meals for any number of days. Each Friday, they’ll update the list, and they’ll feature a lot of meals that utilize foods that are in season. 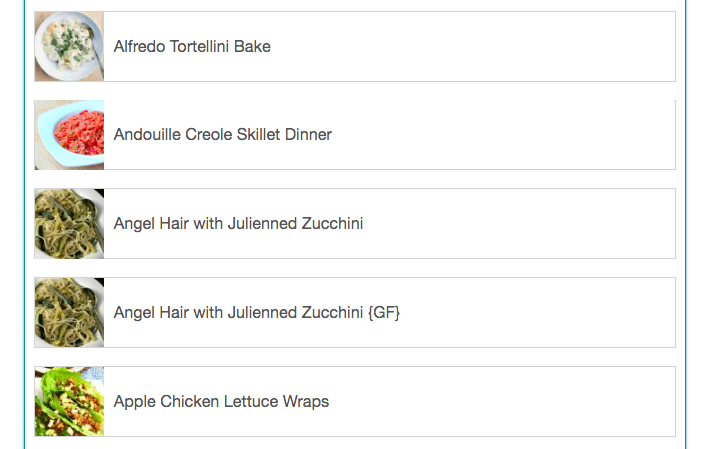 When you select your meals, you’ll also see the ingredients and the prep instructions. You’d also eliminate the costs that inflate your food bill each month, like take-out, convenience stores, extra grocery trips, and work lunches. You’d go to the store once, and come home with everything you need for every meal that week. Once I went to the $5 Meal Plan website I clicked on the Start My Trial button. Then you’re directed to a signup page for the 14-day free trial. Here, you can select the Classic Meal Plan, or you can opt for the Gluten Free Plan. After your two-week free trial expires, you’d be billed $5 a month, either on your credit card or through PayPal. And you can cancel whenever you want. Now, just check the email address you provided, and it’ll contain a link to your account. Once you log in, you can click on Build Your Perfect Plan. 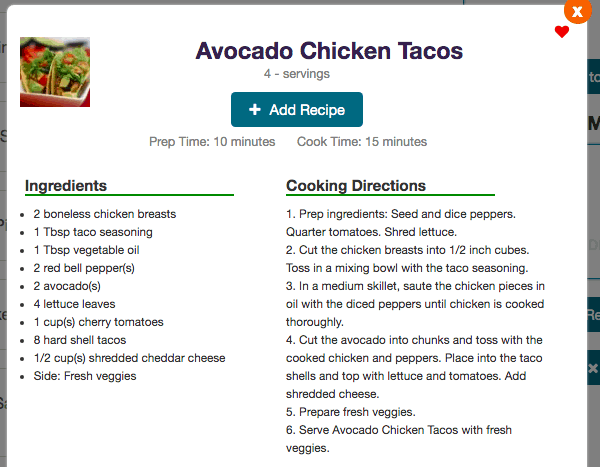 I selected Avocado Chicken Tacos, (below) then I clicked Add Recipe. With each meal you select, it’s added to your plan. I had two weeks of dinners before I got past the “C’s”. 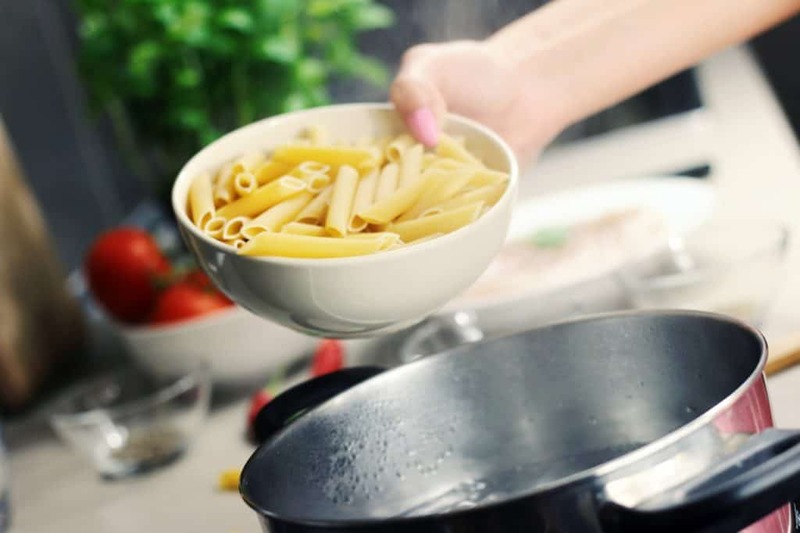 Once you select your meals for the next week or two, click Download, and you’ll have a PDF file with everything you need to make your meals – the ingredients, the instructions, prep time and cook time. You can also print, or email your plan. And you can let the family know exactly what’s on the menu. Once you have your meals for the week, just compare the ingredients to what you have on hand. Now you’ll know exactly what to buy at the store that’ll keep your family full, and eliminate any extra food purchases. The cooking time is posted on each meal, so you’ll know what nights of the week you’ll make a quick dinner, and what nights you have a little extra time. 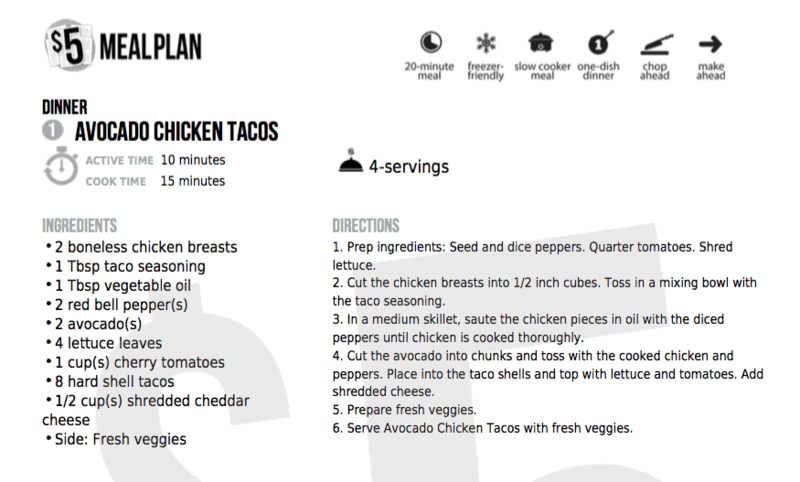 The idea of $5 Meal plan is to save time and money, and the recipes follow suit. They all range from 5-20 minutes of prep time, and 0-20 minutes of cook time. Anything I’ve made so far, has been ready to eat in under 30 minutes. For us, having a healthy meal that everyone likes on the table that quick has been a big improvement. The recipes are measured for 4 servings, so depending on the size of your family, you can adjust it, or plan for some leftovers. One thing I really like is how their shopping list is laid out. Let’s say you’ve picked meals for an entire week. They combine the ingredients you’ll need for all of your meals into one list, separated by food sections. So all you’ll need to do, is check your kitchen inventory, and if you don’t have a particular item, put a checkmark next to it on your shopping list. How easy is that! For each meal, you can click on a nutritional information page and view the per serving fat, carbs, calories, fiber, sugars, protein and sodium. So if you’re trying to stick to a high protein, low carb diet, it’s pretty easy to select those meals. You can also select an entirely gluten-free menu list. But I’ve noticed that even on the “Classic” menu, there are some gluten-free meals that are marked with a “GF” next to them. You can pay someone to do anything from shampoo your carpet, to pick up your dog’s poop. But not every service is cost effective. Most services will save you time, but not money. That goes for food services too. Some deliver ready made meals, where all you need to do is pop them in the oven. But you’re probably paying more for the food, plus the packaging, a delivery charge, and a tip. That’s fine for someone with a high salary and not a lot of time. $5 Meal Plan is designed to save both time and money. 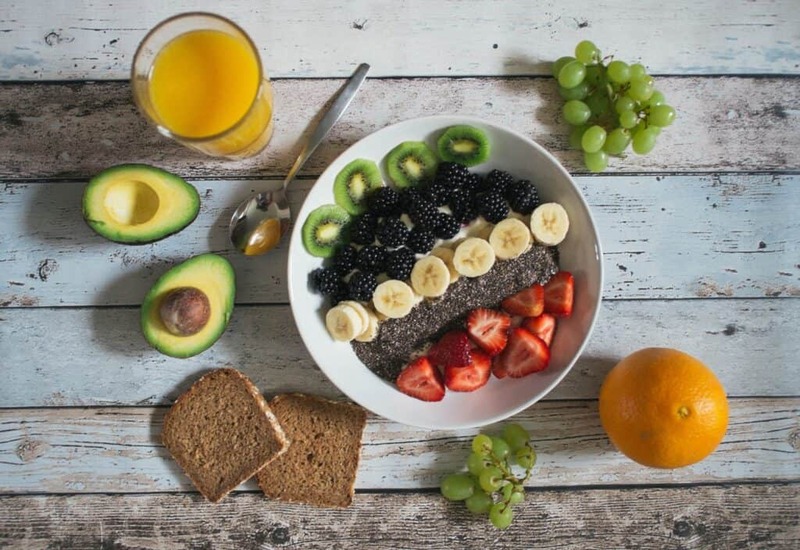 Their aim is to eliminate the time it takes to plan meals, by giving you a simple plan for each week, along with the ingredients and health information for each one. If you follow the plan, you’ll be spending an average of $2 per person for each meal, and sometimes less. Nobody really understands what it takes to run a household except the person doing it. Laundry, cleaning, paying bills, organizing, childcare, providing the right kinds of food… phew!… it’s exhausting! When we spread ourselves thin, we end up cutting corners. We’ll order take-out, stop for fast-food, or we’ll leave grocery shopping till the last minute, then rush through the store. Three days later, we’re scrambling for something to make for dinner. That cycle leaves us not only frustrated, but spending a lot more each month. When I finally took the time to write out a budget, my biggest eye-opener was how much we spent on food each month. For an average family, food is one of the top 2 or 3 monthly expenses. For us, it totaled $800-$900 for 3 people! Notice I didn’t say groceries, but food. We buy food in so many ways – groceries, take-out, sit-down restaurants, work lunches, convenience stores, etc. And many of the non-grocery store purchases are because we don’t have the right kinds of food at home. So we’re forced to buy it somewhere else. I’m not suggesting you never go out to eat. I love trying new restaurants. But by making one trip to the grocery store, and coming home with everything for each meal, we immediately reduced our monthly food cost by over $300 dollars. We didn’t need to order take-out once or twice a week because I had nothing planned. We had leftovers or other food to eat for lunch. We eliminated extra grocery trips for those “2 or 3 things” when we’d spend $30-$40. A certain picky eater in our family has liked every meal we’ve made so far. Food planning can absolutely save you a lot of money each month. But for the average family, not all food planning services make sense. If you’ve avoided trying a food plan so far because of the cost, you might want to consider $5 Meal Plan . At $5 a month, it’s about the least expensive food plan, with the highest ROI. It’s ridiculously easy to use, will save time, and most likely, several hundred dollars each month. Spending a little to save a lot never gets old! How about you? Have you tried $5 Meal Plan, or another plan that’s worked well?